Jimmie Johnson(24), Chase Elliott(9), Erik Jones(20), and Denny Hamlin(11). These 4 drivers start the Federated Auto Parts 400 below the cut line for the first round of the NASCAR Playoffs. All 4 want to leave Richmond Raceway in the top 12 after this race. A 120 mph short track is enough to cause playoff anxiety. But, next week is the Roval at Charlotte. No one wants to have to crawl out of a points deficit hole at that track. The unknown is intimidating even to the best drivers in the world. Hamlin starts 2nd, Jones starts 8th. The challenge will be a bit more difficult for Elliott and Johnson who start 18th and 21st. Kevin Harvick(4) won the pole. He starts on the front row next to Hamlin. Martin Truex Jr.(78) qualified 3rd fastest. Kyle Busch(18) starts 11th. Brad Keselowski(2), the winner of 3 in a row, takes the green flag in 7th. Stages at Richmond are 100, 100, and 200 laps. It’s a safe bet that pit-stop strategy will be critical in gaining track position. Who will race for the Stage points and who will position themselves for the race win. A guaranteed advancement to the next round regardless of points. Kyle Busch brushed the wall during qualifying and his crew determined they needed to repair the damage. He was penalized for an unapproved adjustment and will start the race in 39th. 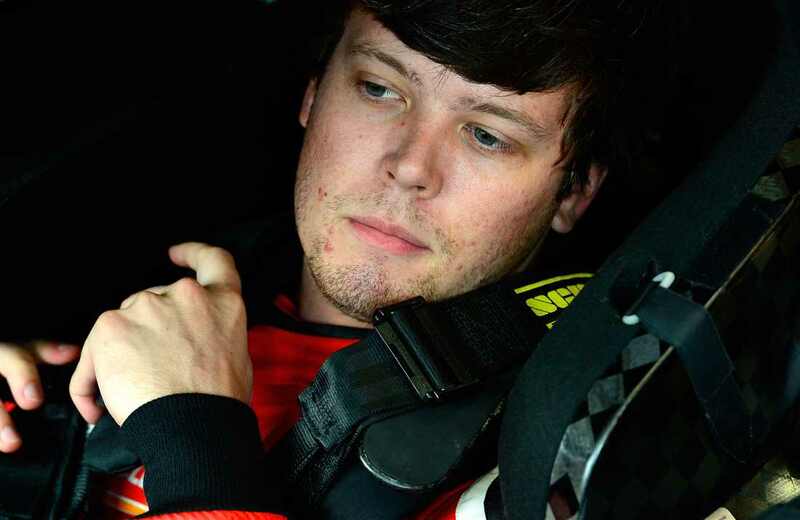 Severely putting a damper on his effort to repeat his Richmond spring race win. Harvick drove to the lead and led the first 40 laps of the race. 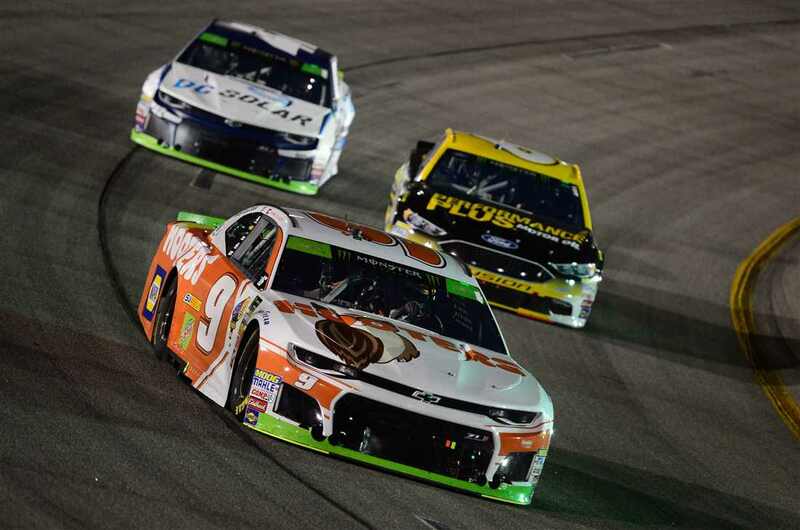 Truex Jr. took over the top spot but could not drive away from Harvick. Some drivers opted to split the first stage in half and pit early. Although not a title contender, Ricky Stenhouse Jr.(17) choose that strategy. With fresh Goodyears, Stenhouse could easily pass cars running on worn tires. He misjudged his closing rate on Hamlin and spun the 11 car sideways coming out of turn 4. Somehow Hamlin managed to save the car and straighten it out. However, the slide damaged his tires and he was forced into the stop at halfway pit cycle. Truex Jr. held off several charges by Harvick and went on to win the Stage. Keselowski worked his way into 3rd. Hamlin recovered to finish in 9th place. 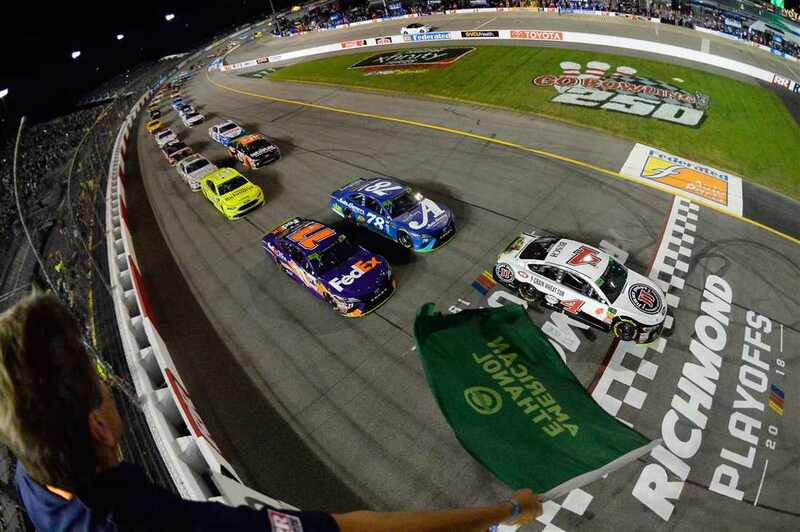 All 100 laps in the stage were run under the green flag. Truex Jr., Harvick, and Aric Almirola(10) exited the pits 1-2-3. Keselowski had trouble with the right front tire change and dropped out of the top 10. Jones crew dropped the rear jack screw adjustment tool. He was forced to restart from the rear of the field in 24th place. With no cautions in Stage 2, it was line up and drive. The Stage ended the same way it started with Treux Jr. getting his 2nd Stage win of the evening. During the Stage ending pit stops, Truex Jr.’s crew had an uncontrolled tire. The penalty sent him to the tail end of the field. Truex Jr. restarted in the 20th position. Elliott led the field off pit road and led when the race went back to green. Keselowski overcame his earlier pit issues and took the lead on Lap 214. The First Caution for an On-Track Incident. On Lap 325, Jeffrey Earnhardt spun exiting Turn 2 and brought out the caution for the first on-track incident of the night. The yellow flag allowed the leaders to pit under caution and everyone get fresh tires and enough fuel to finish the race. The race restarted with 68 laps to go. Kyle Busch led Harvick, Keselowski, Elliott, and Almirola to the green flag. With 58 laps to go, Keselowski drove around Kyle Busch to take the lead. Four in a row, at this time of the year, would be an unbelievable accomplishment. Kyle Busch hung to the rear bumper of Keselowski. He repeatedly drove up beside the winner of 3 in a row until he was able to regain the lead with 37 laps to go. Busch’s car seemed to come alive as the laps mounted. Keselowski’s car began to fade and Harvick passed him with 29 laps to go. By the time Harvick moved into 2nd he was over 1.5 seconds behind Kyle Busch. With 20 laps to go the margin from 1st to 2nd remained consistent. Keselowski continued to fade and Truex Jr. moved into 3rd. The “Big 3” were the top 3. Working through lapped traffic Harvick cut the deficit to under a second. But, he could never get to the rear bumper of Busch who scored his 7th victory of the season to match Harvick. More importantly, Busch punched his ticket into the next round of the playoffs. The victory was Busch’s 50 all-time on the Cup circuit. 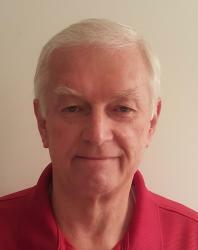 He passed Tony Stewart and is now tied for 11th most with Ned Jarrett and Junior Johnson. The top 12 finishers were all Playoff drivers. 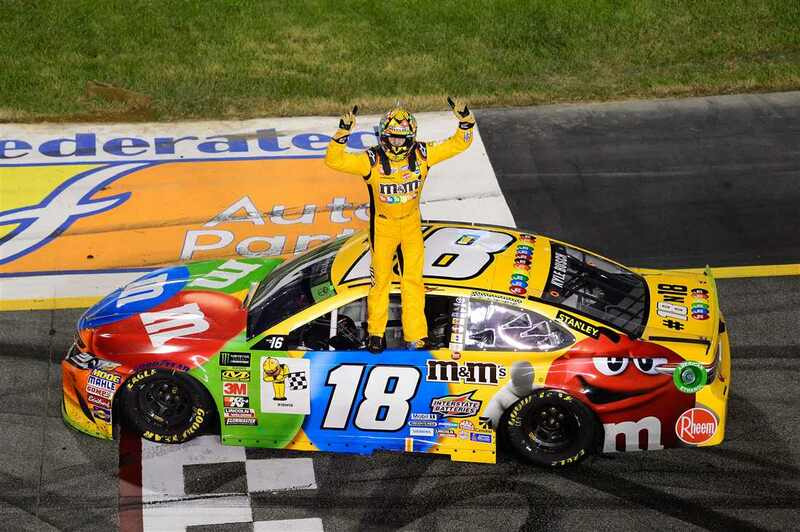 Kyle Busch and Keselowski are on to the next round with wins. So is Truex Jr. based on points. Harvick is virtually assured to move on and should easily clinch next week. Everyone else is potentially in danger. 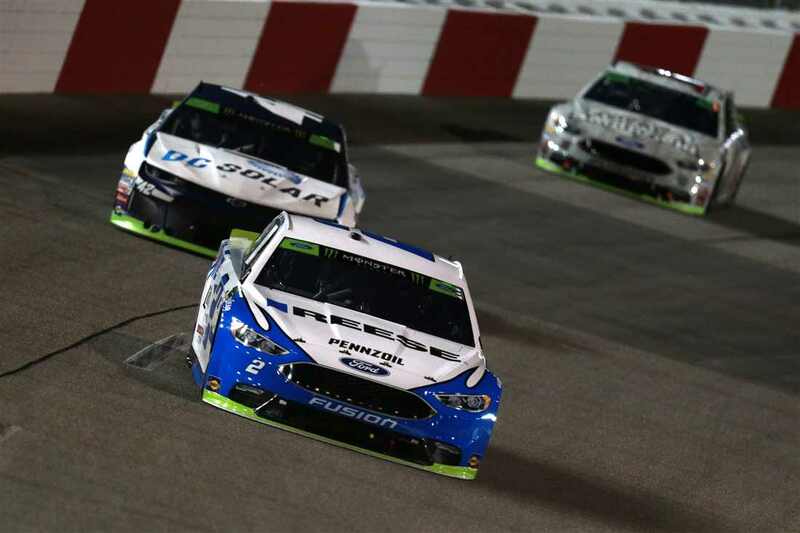 Ryan Blaney(12) sits on the cut line, 4 points ahead of Clint Bowyer(14). Alex Bowman is only 1 point clear of Blaney, Elliott and Austin Dillon(3) sit tied 10 points out of the final Playoff spot. Bowyer, 4 points back, and Johnson, 6 back, both have a realistic chance of racing themselves into Round 2 on points. Jones, 21 back, and Hamlin, 29 back, will likely need a win to move forward. Jones had a decent run, finishing 11th, and still lost 2 points to the cut line. That is how competitive the Playoffs are.